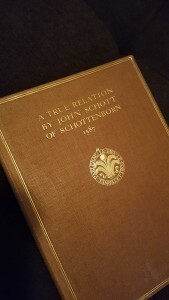 English translation of Johann Schott von Schottenborn’s book on the family history. There are several theories for the origin of the name Schott. The one described by Johann Schott von Schottenborn in 1587 is that Schott ancestors originated in the town of Schotten in Hessen, Germany. He describes how his branch of the family left Schotten and settled first near Eisemroth, Hessen. They were smelters and forgers of iron goods for many years until the late 1100s when the country and forests were destroyed due to the wars of Emperor Friedrich Barbarossa. Without forests to provide the charcoal necessary for iron smelting, the family scattered throughout Hessen. Johann Schott von Schottenborn’s ancestors settled in Braunfels, Hessen. As these families scattered, they would likely have been known as being “zu Schotten” or “from Schotten,” which would have eventually been shortened to using Schott as a last name. Later critics of the 1587 Schottenchronik are Von Hartmann Pieper and J. Reinhardt Schott, Jr., who published an update to this document sometime after 1960. They warn that Johann Schott von Schottenborn’s work is based on oral tradition, not documented fact or church records that can be objectively proven. They suggest several other possibilities for the origin of the Schott name. One possibility is that any foreigner that was from Scotia (Scotland or Ireland) might have been tagged with the name Schott or Schotten whether or not they originated from the town of Schotten. They believe that it would have been very common for a foreigner to have been singled out even before last names were commonly in use. Pieper and Schott also suggest the possibility that Schott was a variation on a word for peddler or merchant. Another possibility is that it came from a medieval first name, Schotto. While it’s true that there are many possibilities for the origin of the name and that the genealogical facts in Johann Schott von Schottenborn’s 1587 document are based primarily on oral tradition rather than documentation, there are a number of pieces of evidence that would seem to (at least partially) support his opinion. A number of Schott family branches in various locations had coats of arms. While none of these are the same, many of them have similar objects on them—most commonly showing a pod or bundle of pods. (In German, a pod is a Schote—possibly a play on the name Schott.) This could indicate a connection among Schott families in many locations. Johann Schott von Schottenborn mentions three Schott brothers who scattered from Eisemroth first to Worms, then to the Strasbourg area in the early 1200s. Other documents from the 1500s corroborate that there were indeed three brothers named Schott during this time in Strasbourg who had come from Worms. One document would have been in an archive that it is unlikely Johann Schott von Schottenborn would ever have seen; another was published after his death. So although his information may not have been 100 percent accurate, there is evidence that supports at least some of it. 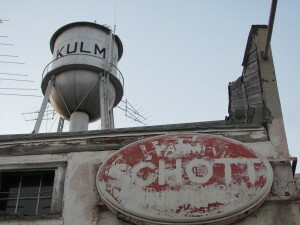 My branch of Schotts ended up in Kulm, North Dakota. Therefore, it seems plausible to believe that a great deal of the 1587 document could be accurate, including its speculations on the origin of the Schott name, although it can’t be proven with complete assurance. Scott, Sir Samuel Haslam of Yews. “An Old German Family History.” The Ancestor (London, April 1903). And that is why history is so fascinating … beyond or below or above the &#t6;21fac8s’ …thinking of real people … as flawed as any we know … but especially those who created wonderful things out of being flawed … with genius mixed in … Love what you created here out of your experience … connecting the present to the past, as it always is connected. Especially in its mysteries. I found a copy of the book online at a bookstore in Ireland, and was able to purchase it from them. But that might have been a fluke. My mother-in-law was a Schot [In Holland the double t became single], so I am interested in all about Schott. I will have a look in more detail another time, but I want to make you a compliment now. Your site is a pleasure to visit. I like to send you the line of Schott’s I have gathered over time back to Emmerich Schott born Braunfels (Germany) r1430. Hi Otto! I would LOVE to see what you have about the Schot family in Holland. I don’t know if they connect to my line, but I would love to try to fit more of the pieces together!